For those who don’t know Verkami, it’s startup based in Catalonia that, while something of European take on Kickstarter in the US, has it’s own angle, specifically in terms of funding wine projects. We’ve pitched in to a couple of campaigns like the Uvas Nomadas which was quite good as well as the Cepas de la Culebra which should arrive in the coming few months. 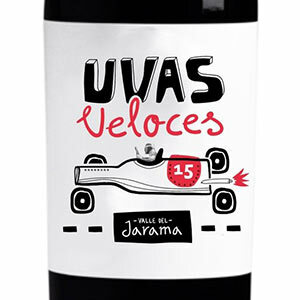 Right now, there’s a new campaign for Uvas Veloces (speedy grapes) a project by a fellow named Oscar Pasanau of Mas d’en Just. We had the chance to meet Oscar when updating the Priorat book because his family is originally from the village of Poboleda where he has a small cellar. He has been living and working in Madrid for some time and was recently able to restart his Priorat winery (he had been selling his grapes for a few years) and as we’ve now learned, get this wine project just outside of Madrid going as well. Basically, he’s making a young wine from old Grenache vines of 65 years and unlike other projects, the wine is essentially all ready to go and will be released shortly so if you chip in to the funding, you’ll get your wine in time for late spring meals. We’ve tasted Oscar’s wines from Priorat and they’re good wines. He’s actually a bit of an underdog in his village as he has such a small production but rest assured, he knows what he’s doing. This is especially important as he’s working with a Grenache vineyard in the village of El Molar (no, not the one in Catalonia but in Madrid) and he’s hoping that if this project can get up and running a fourth subzone based on this area, Valle del Jarama can be added to the DO Vinos de Madrid appellation. It’s a worthwhile pursuit as Grenache grows very well in the center of Spain and has a very, very different character than what you find in Catalonia or the south of France. So, if you can receive the wines, take a look at these very reasonably-priced wines and be one of the patrons. We’ll let you know how the wine is regardless as we’ve already reserved a case for ourselves. Can’t get enough of tasty, tasty Grenache!